[T]his UNESCO World heritage Site was famously described by T. E. Lawrence as, “vast, echoing and God-like” and it is acclaimed by many as one of the most stunning desert landscapes in the world. Also known as ‘The Valley of the Moon’, this is the place where Prince Faisal Bin Hussein and T.E. Lawrence based their headquarters during the Arab Revolt against the Ottomans in World War I, their exploits being an important part of the history of this amazing area and recreated in the 1962 film ‘Lawrence of Arabia’. [S]erious mountaineers relish its challenging climbs (some 1,750 metres up sheer granite and sandstone cliffs) while casual hikers enjoy the peace and tranquility of its sweeping vistas, towering rock faces, and boundless empty spaces. Those of calm disposition will probably prefer a camel ride or a night under the stars in a Bedouin tent. Nature lovers will be drawn to the desert in spring time, when rains bring the greening of the hills and something in the region of 2,000 species of wild flower. 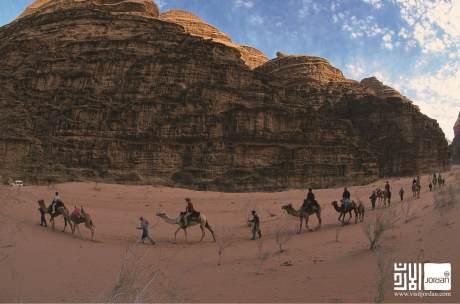 Options for exploring Wadi Rum include 4×4 vehicles and camel caravans. However, the best way to experience Rum’s grandeur is by hiking on foot and camping.